Hanoi (VNA) – Australia recently announced that it would permit the import of Vietnamese dragon fruit, making Vietnam the first country to get licence to export fresh dragon fruit to the country. 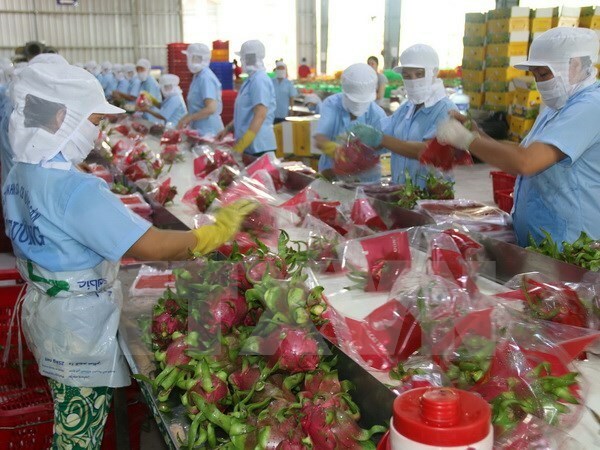 Dragon fruit is one of Vietnam’s key export fruits, and saw export sales worth 895.7 million USD in 2016, accounting for 50.3 percent of the country’s total fresh fruit exports and 36.1 percent of its total fruit and vegetables exports. The Ministry of Industry and Trade said that in order to export goods to the Australian market, exporters must comply with stringent regulations. Specifically, businesses must have a valid licence issued by the Australian Department of Agriculture and Water Resources as well as a certificate of no-insect infection in the area of biological safety control by Vietnam’s Plant Protection Department (PPD). The fresh dragon fruit must originate, be produced and exported from Vietnam, in accordance with relevant conditions and programmes. Before shipment, the fruits must undergo vapour heat treatment (VHT) for 40 minutes at 46.5 degrees Celsius at a minimum of 90 percent humidity at a processing facility approved by the PPD. The produce must be free of insects and diseases and must not have contaminant pollutants. Packaging must be done using synthetic materials or highly processed materials of plant origin; unprocessed materials such as straw cannot be used. The cartons or individual packages must be tied firmly and labelled with unique identifier to facilitate traceability. The treated products must be protected from harmful insects during and after packaging, while handling, storing and transporting between locations. Products that have been inspected and certified by a competent authority from Vietnam must be maintained in a safe condition so as not to be mixed with fruits exported to other markets, or for consumption in the domestic market. The PPD must inspect containers prior to loading and ensure there are no insects, and all vents must be covered to prevent insect infiltration. The Australian Department of Agriculture and Water Resources can review the import policy at any time after trade commences, or when pest and quarantine control rules in Vietnam are altered.